Docbook allows to write a book that can not be read. Ok, it is a joke, docbook holds the semantic content of the book in XML (or SMGL), but it contains nothing how this can be visualized. You might ask yourself what is this all about, why not just using something as OpenOffice Writer to the documents. If you ask yourself this question, then just use OpenOffice Writer that's fine. However when the book becomes a project, or when it comes to publishings to different formats, having amendments, corrigenda, versions or you want to make it available in different formats as pdf and HTML or more people write the same book, then you are better of having something as docbook. Since it is ASCII, you can have a version management system as CVS and compare the differences using diff. Unfortunately Docbook had a major evolution behind, that is still ongoing and therefore might confuse people who want to start with it. In the past docbook was SGML, used DSSSL style sheets and TeX as engine (jade and jadetex). This is still working but nowadays docbook has moved to XML, used XSL (libxslt libxlm2) to convert in HTML and the XSL-FO engine (fop) to convert to pdf. Docbook uses common xml tools and can therefore make use of many tools, this is the advantage of docbook being pure xml. Article is something smaller than a book. Book, I guess you know what it is. Use this as default. In general docbooks are validated using its DTD, parsed and then translated in the desired format. What is used for that is not a simple tool, it is a toolchain, a chain of different tools and of course command line tools. Docbook files have often the extension *.docbook, this causes sometimes problems with generic tools, a better option is calling them just *.xml. Good tools and operating systems look anyway to the files internal data and will find out that it is docbook using xml and even see the version numbers of docbook. To have good picture support, to not create a mess when they got converted from docbook to an other format especially pdf or having a too big or bad resolution adjust the pictures to be used. Use jpg since this is widely supported and has tags containing picture information that can be added and read. In gimp you can do both with the scale image dialog. Links point to a file or a location in a file. To mark points in a file, id attributes can be added to tags as: <sect1 id="Docbook"> marks and gives section 1 (the Docbook section in this document) the id Docbook. since they make an error when processing the xml. The id is an attribute and can not stand on its own without a tag. The anchor tag is basically a dummy tag that allows to place an id. However anchor tags cause errors when converting xml to pdf using fop. So don't use them. and here how it looks like: http://www.linurs.org. In serna it looks a bit scary, since it prompts to insert the link text, but this can be ignored, since we want here the uri to be shown as it is. So what we see is consistent with the link.When the document is converted to pdf (means print to paper) both, the text and the link are printed. If they are equal then it looks silly, so keep links empty except if the text is different from the link. A link to an other xml file can be done by using the <ulink> tag as it is used to link to some web site or files. This approach is not very portable and needs a web server to be installed. Since the two files have links they are linked, but it is desirable to process and edit them independently. The two files might be in different directories. However they must know about where they are since they share links. To get an index the element <index> needs to be set in the place where the index should appear. To have items popping up, the element <indexterm> is used. This is actually a bit tricky since putting it right here shows nothing in the text. However what is put here invisible pops up in the index. A child element of the <indexterm> is <primary> that holds the text popping up in the index. A <primary> element can have multiple <secondary> child elements. This seems to do not a lot, but it gives the change to communicate the language to stylesheets and allows the stylesheets to select the proper language for automatic text added typically for formatting as chapter for English or Kapitel for German. The entity allows also something as variables. Stuff that is repeated should be define there. Tags as <article> are also not allowed for the same reasons. Serna-free allows to edit such docbook data as everything would be inside the same file. Additionally single include files can be edited. Metadata is data not visible in documents. If docbook is exported to html meta data should be created, since Internet search machines look for meta tag to put your web page in higher rankings. The docbook <abstract> tag should hold a description, in a form of a single sentence. This tag will be exported as description meta data in html (set the stylesheet parameter 'generate.meta.abstract' to 1). It should be between 150 and not longer than 160 characters. The description meta tag is quite important since search machines show the description tag in the search result to the users. Keywords for the meta data can be inserted between the <bookinfo>, <chapterinfo> or <sect*info> tags, where <keywordset> has to be selected, the individual keywords are inserted into the <keyword> tag. The keywords and will be converted to the keyword meta data in html. It is also possible to comma separate the keywords and having just one keywords element. The keywords meta tag is no more important for search machines. When splitting files, the path the the files included has to be put in the parent file. Each time you move a child file from one directory to an other, the parent file needs to be edited to know about it. Vex http://wiki.eclipse.org/Vexis gpl and based on the eclipse platform. With eclipse installed vex can be installed through the eclipse marketplace. As usually in eclipse a project must be created, select just a generic project this puts a subdirectory under the workspace. Then you can put your docbook files there. To create select XML authoring> File. VEX is the visual XML editor, but you can open at the same time the regular XML editor (that allows you to view the elements, but also the raw characters). Make sure you select the XML Authoring Perspective to get all the right windows open. Vex can also be used to edit custom xml files as WYGIWYS. Create a new project via XML Authoring > Visual XML plug-in project type. This creates two file the hidden .project file and a file vex-plugin.xml. Now a DTD defining the structure and rules and a CSS defining the appearance must be put in this directory. The CSS must contain quite a bit to make a satisfiable result. Basically every element tag should have its definition. Those two file need to be registered in the vex-plugin.xml file that is best created using the GUI of VEX. First register the DTD file. This is done by selecting the DTD file and go to Properties > Visual XML Document Type. Fill in the fields, name and system ID get <filename>.dtd and the public ID something as -//DTD <name>//EN then press apply to see the list of elements. Select there the root element. Now register the css, by selecting it and go to Properties > Visual XML Document Type. The name is <filename>.css and select the corresponding css. DEP4E is a eclipse docbook editing plug in. It is available as free http://www.xmlmind.com/xmleditor/what_is_xxe.html but also as full featured commercial version. Serna is a WYSIWYG XML editor. Serna existed upto 2011 as free version. But now the free version is no more available. A gentoo ebuild can be found on my overlay. Since it is no more available the fetch from the internet will not work anymore, so the files have to be copied to /usr/portage/distfiles manually. or create an icon on the desktop. There is different levels of checks available, as default you can not make violations when you edit. But this can be a pain when you import and edit some file. In the menu item Edit => Validation move the level from strict to on to get less errors reported. Docbook can be read in XML capable editors as Bluefish, Screem. Emacs is also possible to be used but it has a horrible user interface and is mega complicated. Lyx aims to be used as well but it has no XML support, not nicely integrated, old lyx versions recommended. The latex fronted lyx supports export in docbook format and gentoo has even a docbook useflag to enable this support, however they consider docbook to be slightly bloated. 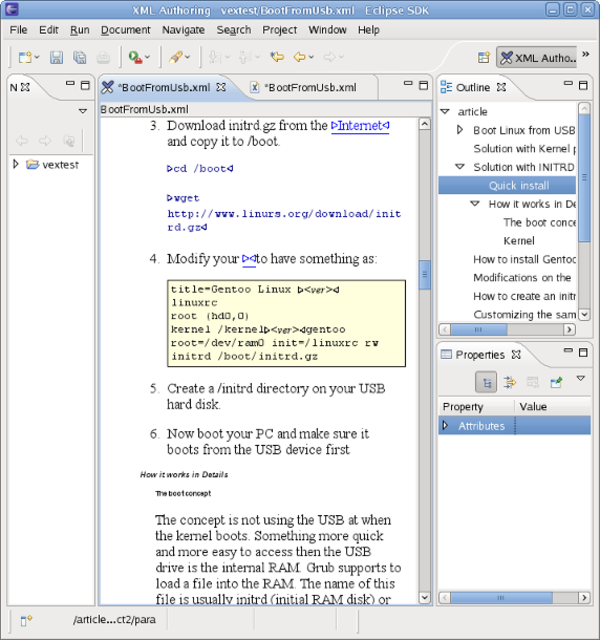 Quanta could be an option to edit docbook files but it is connected too tight to kde, and therefore makes sense just for kde users. Xerlin and pollo are other applications that are also outdated and run badly. 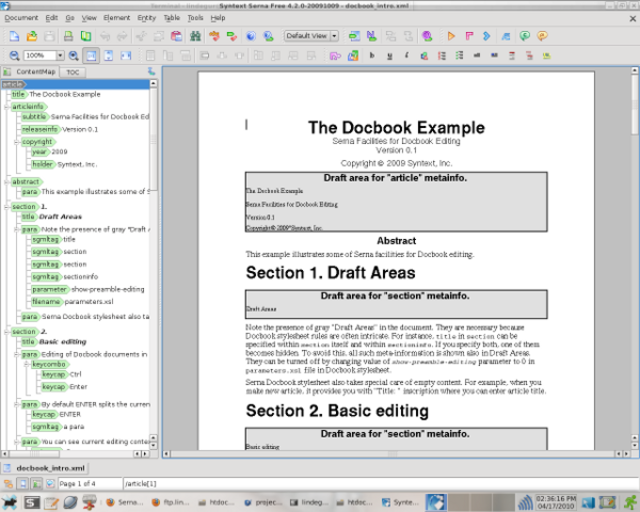 For OpenOffice there is a docbook template http://www.openoffice.org/xml/xmerge/downloads/DocBookTemplate.stw open it and edit the file with open office, when done it can be saved as docbook. After emerge docbook-sgml-utils a lot of docboo2* commands are available. Many editors as Openoffice can directly open the docbook xml files. However it can happen that not all features are supported and no pictures appear. Create a link from where the pics are to a pics directory in the html directory otherwise the links to the pics will fail. Since filenames become lower case, don't use uppercase or CamelCase in the id's. A set of HTML pages are created that are linked with each other. The index.html page is the start. Since docbook is XML, XML tools can be used to convert docbook files. See also Publishing XML Documents. The big advantage is that docbook stylesheets are available /usr/share/sgml/docbook/xsl-stylesheets/ http://www.sagehill.net/docbookxsl/index.html http://nwalsh.com/docs/articles/dbdesign/ that allow to convert efficiently to different formats. Those stylesheets can also be customized using parameters passed on command line. This depends on the xslt processor since it has to pass them to the stylesheets. The stylesheet must be found in the location of the html pages, or an other parameter must be used to tell where it is. user.<header or footer>.navigation goes on the outside and user.<header or footer>.content goes on the inside of the page. firefox has two addons one is a epub reader the other a epub writer. Epub3 can also embed movies. Note, there is no need to specify the output file name, since this is chosen automatically. Wordml is an xml format that Microsoft Word understands. It makes use of the stylesheets found in /usr/share/sgml/docbook/xsl-stylesheets/roundtrip. Those stylesheets allow both converting WordML in Docbook and converting Docbook in WordML It supports also to add a WordML template. The stylesheets coming with docbook allow to create webpages that are linked together. It uses the <webpage> element that is not a valid docbook element additionally not all docbook elements are supported. http://docbook.sourceforge.net/release/website/example/index.html contains additional documentation and shows how such web sites will look like. The stylesheets coming with docbook allow to make a slide show with navigation icons similar as power point, but there is no need to have a program installed, since it runs entirely in the web browser (except if the pdf version is selected). In the web browser go in in Full screen mode. It uses special elements that are not a valid docbook elements.